Staub has developed a new kind of ceramic which is less porous and more resistant to cracking and thermal shocks. This new clay gives gentle heat distribution and brings out the food's flavor. When your meal is ready, La Cocotte moves beautifully from the oven to your table. 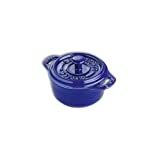 With these 2 round mini cocotte you can bake charming individual portions while entertaining your guests. They are the perfect size for accenting a table with dips, condiments, cheeses, salsas and aioli. The lid makes it practical for heating up sauces in the microwave or keeping snacks fresh. Can be used in a microwave oven.